Copyright (c) 2010, Sebastian Kosch (sebastian@aldusleaf.org), with Reserved Font Name “Crimson Text”. 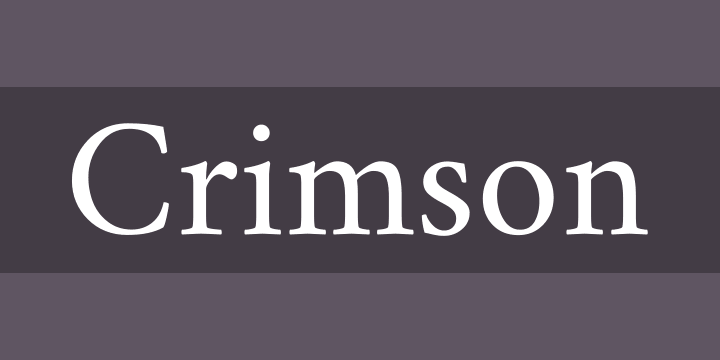 Crimson Text is a font family for book production in the tradition of beautiful oldstyle typefaces. There are a lot of great free fonts around, but one kind is missing: those Garamond-inspired types with all the little niceties like oldstyle figures, small caps, fleurons, math characters and the like. In fact, a lot of time is spend developing free knock-offs of ugly “standards” like Times and Helvetica. Crimson Text is inspired by the fantastic work of people like Jan Tschichold, Robert Slimbach and Jonathan Hoefler. We hope that the free type community will one day be able to enjoy Crimson Text as a beautiful workhorse.